On 25 April 1917 she made her debut with the Opera Ensemble of the Singing Academy "Cornélie van Zanten" at the Royal Theater of the Hague as Alice in ‘’Falstaff’’ by G. Verdi. On 4 October 1919 she sang the same part in the first performance of the newly established Residence Opera-Association of Hendrik van den Berg and Carel Butter van Hulst. That season she made her debut at the N. V. National Opera of Willem Vergara Jr. There she sang on 15 November 1919 the part of Antoinette in ‘’Le Cage’’ by Xavier Leroux, on 22 January 1920 Arsinoe in ‘’Die toten Augen’’ by Eugen d'Albert, on 8 February 1920 Santuzza in "Cavalleria Rusticana" and on 22 April 1920 Lange in ‘’Le Fille de Madame Angot’’ by C. Lecocq. During that season she also appeared in operas of R. Wagner: Brangäne in ‘’Tristan und Isolde’’, Venus ‘’Tannhäuser’’ and also Julietta in ‘’Les Contes d'Hoffmann’’ by J. Offenbach. In the 1920/1921 season she sang at the S. A. National Opera. On 23 September 1920 she appeared as Lange, on 27 September 1920 Santuzza, on 13 January 1921 Rosalinde in "Die Fledermaus" by Johann Strauss, on 17 February 1921 Elisabeth in ‘’Tannhäuser’’. On 2 October 1922 she appeared at the N. V. National Opera as Carmen. On 19 December 1922 she sang the part of Leonora in G. Verdi's "Trovatore". On 22 January 1923 she performed at the Royal Theatre at the Hague as Aida. she sang at the N. V. National Opera on 7 April 1923 the part of Kundry in R. Wagner's ‘’Parsifal’’. At the N. V. National Opera, on 28 September 1924, she appeared as Marguerite in ‘’Faust’’, on 24 January 1925 as Pamina in ‘’Zauberflöte’’. 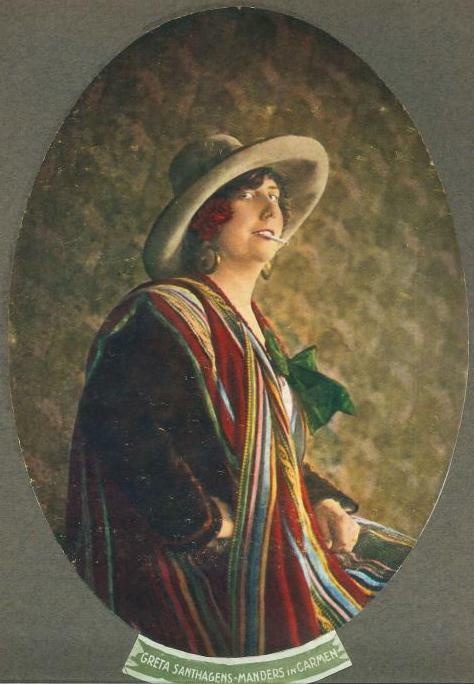 On 9 March 1925, as a member of the Co-Opera-Tie, she appeared as Santuzza and Marguérite. On 1 October 1927 she sang the part of Marguerite at the Dutch Central Opera. She performed that season with the Co-Opera-Tie: on 16 October 1927 Venus, on 26 December 1927 Elsa in ‘’Lohengrin’’, on 3 January 1928 Sieglinde, Gutrune on 14 February and on 26 February 1928 Rachel in Halévy's ‘’La Juive’’. She retired from the stage in 1928, after the birth of her child.